Take a look at any online craft retailer and what do you see? Dozens upon dozens of sewing machines. Do you really need all of them for a simple sewing room setup? Of course not. …then how on Earth will you ever sort through the endless assortment of sewing machines you DON’T need, to find the one or two you actually DO need? The answer is…you can’t. And you’ll make some pretty dumb purchases, and waste a lot of time and money in the process. To spare you the headaches that so many of us have gone through when starting out, I’ve compiled a comprehensive guide which outlines everything beginners need to know, so they can choose the right sewing machine for their home craft studio. Click here to move down the page, and we’ll get started. How Do We Choose the Best Sewing Machines? Which is Better for Sewing? Different Parts of a Sewing Machine! I reviewed hundreds of the best sewing machines on the market in order to put together this list. All of the models I’ve included are outstanding. There are different types of sewing machines intended for specific uses, though, so I’ve highlighted the “best uses” for each sewing machine when writing these reviews. That will hopefully make it easy for you to quickly find the best machine for your needs. Here’s my list of the top 5 best sewing machine reviews of 2019. For most of the last 150 years, people have used the name “Singer” interchangeably with the phrase “sewing machine.” Even after all that time, the company hasn’t lost its fastball; quite honestly, Singer still makes some of the best machines out there. And the Singer Stylist 9985 has won numerous industry awards since it hit the market, for very good reasons. It may be the best sewing machine for the price that you’ll find. This is a small, computerized machine that really doesn’t look like anything special at first glance. But it’s a powerhouse. 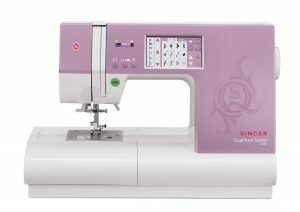 The Quantum Stylist 9985 has 960 different built-in stitches with a huge range of basic, stretch and decorative stitches, plus alphanumeric fonts and 13 built-in one-step buttonholes. There are 13 presser feet, and an adjustable speed up to 850 stitches per minute. It’s everything a beginning or intermediate sewist needs to create their own clothing, to quilt or to craft. The features just keep coming: automatic buttonholer, auto-pilot mode so you can sew without using the foot pedal, programmable needle position (whether you want the needle to stay up or down when you stop sewing), a light that illuminates the workspace, even a free arm where you can store your needles. The only negative is a slight one: this Singer is a little louder than I’d like. To see my complete rundown and reviews of all the best electronic sewing machines, click here. The SE600 certainly doesn’t have as many built-in stitches as the Singer Quantum Stylist 9985, with 103 instead of the whopping 960 you get with the Singer. 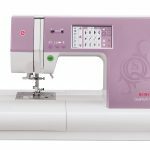 But it’s a better all-purpose sewing machine for most beginners and intermediate sewists who are also into embroidery, thanks to its 80 built-in embroidery designs, 120 frame pattern combinations and nine lettering fonts, making this a fabulous model for sewing, quilting and 4×4 embroidery. In fact, if embroidery is your thing this Brother may be your dream machine. It allows you to connect to an Internet-enabled device (via the USB port) to import any of the thousands of designs available online at iBroidery.com or other sites. You can also download machine updates the same way. If you prefer, you can use the USB port for a memory stick, to load your favorite designs. There’s a large workspace for your embroidery machine and sewing work, an automatic needle threader and thread cutter, a drop-in top bobbin system and bobbin winder, a sewing and embroidery arm as well as a 4×4 embroidery hoop, seven interchangeable feet and seven-point feed dogs that make it easy to advance your fabric at exactly the speed you want. The backlit LCD color touchscreen display not only makes stitch selection and design editing simple and intuitive, but even lets you watch tutorials right on your sewing machine – a very cool feature. 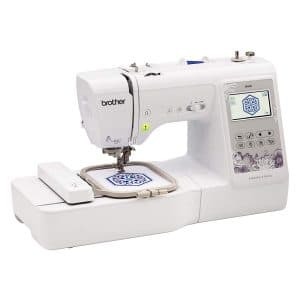 Brother is known its quality and affordable products; whether you’re a relatively new or experienced sewist, this baby will let you sew and embroider for a very long time before it needs to be replaced. I love it and think it’s one of the best sewing machines for home use, particularly for beginners who want to both sew and embroider. To see the rest of my choices and reviews of computerized sewing machines, click here. As you undoubtedly know, an overlocker machine (or serger) is by far the best way to create perfect seams on your garments. (If you didn’t know that, you might want to skip down to my tutorial section and read it before continuing with this review).The Singer 14T968DC is a professional serger which I’ve found to be the perfect companion for any computerized or electronic machine, as long as you don’t need to work with extremely difficult material like canvas. It’s the best sewing machine for overlocking. This high-end serger machine is terrific. It has 2-3-4-5 thread capability (with color-coded threading), allowing you to choose from an enormous selection of styles and then sew, finish and trim in one operation. Chain stitching, decorative edges, cover hems and rolled hems are all effortless thanks to a self-adjusting tension system that automatically chooses the proper settings for each stitch, and a separate rolled hem mode that’s available with the flip of a switch. For example, you can choose from narrow, wide or triple cover stitching, double chainstitching, or perfect rolled hems in just seconds. Not only is the 14T968DC versatile, it’s fast, with a maximum sewing speed of 1300 stitches per minute. It’s sturdy too, with a metal frame that ensures your fabric stays in one place and that there are no skips in the stitches. Seven presser feet are included. 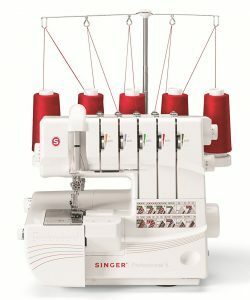 There’s a fairly steep learning curve for those new to sergers, but the time spent learning this Singer machine is well worth it, as its rather high price. Interested in seeing more of my top serger machine choices and reviews? Click here. Chain stitches and cover stitches are your primary interest? 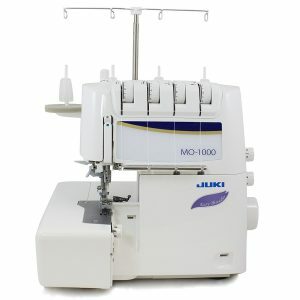 Then the Juki MCS-1500 is calling your name. It’s definitely on the expensive side, but it’s a beast of a machine which will create strong, perfect seams that make your garments look impeccable. The Juki uses three separate needles (with color-coded threading) to do its work; when you’re working on standard stitching for cuffs, necklines, armholes or hems, the four-thread or three-thread (wide or narrow) cover stitch functions are just right. And side seams and waists will never fail when chain stitched with the MCS-1500. This is a well-designed specialty sewing machine. The looper is simple to thread and lowers when you touch a button, and the height and pressure of the presser foot can be adjusted to fit the thickness of the fabric you’re working with. The adjustable differential feed feature works with any type of fabric, even knits and other stretchable materials, and both the presser foot guide (which presses down on both right and left sides) and seam guide lines on the extension plate make sure your sewing is straight and true. There’s a built-in thread cutter on the pressure foot, a thoughtful touch. Juki is known for its outstanding products. Quiet, easy to master and fast (up to 1350 stitches per minute), the MCS-1500 is no exception. You’ll pay a lot for it, but any serious sewist will want it in their arsenal. You can check out my reviews of other chainstitch machines and coverstitch machines. The phrase “mechanical sewing machine” may bring to mind grainy photos or home movies of grandma using an old-fashioned machine that operated strictly on elbow grease instead of electricity. That’s far from the reality of today’s mechanical machines, which are most definitely of the plug-in variety. The phrase just means that they’re simple, dependable and don’t use internal computers to program their functions. 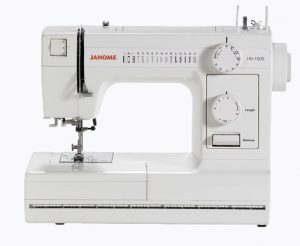 The best of the bunch is the Janome HD1000, produced by a manufacturer that many experts think makes the top sewing machines in the world. It has a heavy-duty body (although it’s made from cast aluminum and not steel), it’s powerful, and it turns out great stitches. The HD1000 is an excellent machine to learn on, but many serious sewists also count on it for its straightforward and reliable performance. This Janome doesn’t have an LCD screen or fancy graphics. You choose your preferred stitch with one of the knobs on the machine, choose the length of your stitch with a second knob, and use a lever on the body to reverse direction – that’s it. However, if you simply want to sew, that’s all you need. There are 14 stitches (including four-step buttonhole) to choose from, four presser feet, a three-piece feed dog system and an automatic needle theader, plus a removable free arm, a front-loading hook bobbin and push-pull bobbin winding which is easy once you get the hang of it. Fancy? Not at all? Inexpensive? No, because the HD1000 is built like a tank and will last like one, delivering outstanding results the entire time. This is a very, very good sewing machine- and not just for traditionalists. For a look at my reviews of all of the mechanical sewing machines worth considering, click here. Choosing the right sewing machine is far from an easy task. This is even more true when you’re looking for something more specific than just about any machine for trying your hand at sewing. And this where sewing beasts like us come in. We have reviewed more sewing machines than we can ever remember, and we would be surprised if there’s any type of machine under the sun that we haven’t seen or reviewed yet. Well, with that said, some of the important factors we consider when picking our products include the following. As surprising as it might seem, a sewing machine specifically designed for quilting may turn out to be great for quilting projects, but nowhere near as good when it comes to embroidery stuff. Now, while this seems to be obvious, not many seem to get it. And therefore, we always make sure we recommend products that are specifically designed for your needs, especially if they are specific and a generalist sewing machine won’t be able to cut it well. While this might seem obvious, the way we analyze the features of a sewing machine may be well beyond most sewers. Remember, it’s not just about the number of stitches or readymade designs they come with, or even the simplicity of use for that matter. Not that these things don’t matter, but there’s a lot more to it. Let’s face it. Most of the people reading our articles are beginners to the world of sewing, and they would be scared into thinking it’s not for them if we introduce them to a super sophisticated and advanced sewing machine. Hence, the ease of use tends to be a crucial aspect of the products that we take into consideration when choosing our top picks, especially unless we are writing for advanced sewers that couldn’t care less about the ease of use offered. If you’re a beginner, check out our list of sewing essentials! These are just some of the things we consider when choosing the best sewing machines, and we shared it just to give you a bit of an idea. There’s a lot more that goes into our research process and explaining everything of it would probably require writing a new article solely dedicated to it. Will fit into 1 of these 2 categories. That part’s real simple. The harder part is understanding the 8 KEY WAYS in which they compare. Industrial sewing machines are more stitch-specific; performing one stitch really well. Domestic sewing machines can do every type of stitch pretty well. While the truth of the matter is far more complex, it’s a good rule to start with. Industrial machines specialize in one stitch. Therefore, they produce a cleaner, better-looking stitch. Domestic sewing machines will usually require a little extra fussing to get the stitch just right. The upside of domestic sewing machines is that they operate at a much slower pace. As we mentioned above, you’ll sometimes need to fuss with the stitch to get it just right. By operating at a slower speed, you can easily control the machine reducing the amount of fussing required. Industrial machines allow you to sew extremely quickly. That’s the benefit of the machine specializing in one stitch. The downside of domestic sewing machines is that they have smaller motors which cannot handle all types of cloth and fabric. Home machines generally CANNOT handle larger cloth and thicker fabric. Made with commercial production in mind, industrial sewing machines CAN handle larger cloth and thicker fabric. Being built for commercial production means that industrial sewing machines can be operated for longer periods of time. The General Rule of Thumb is that you cannot use a home sewing machine for more than 5 hours at a time. If you go over 5 hours, you risk burning out the motor. Industrial sewing machines can easily work for more than 5 hours at a time. It should be pretty clear by now that industrial sewing machines can handle heavier projects. Thread capacity and type is no different. Industrial machines can easily handle thicker thread and larger cones. You’ll use thicker thread when sewing through heavier cloth or thicker fabric. Domestic sewing machines need to use lighter thread with smaller cones. However, because you’ll be using your domestic sewing machine for smaller projects, this shouldn’t be a problem. Because you’re going to be doing smaller projects with home machines, you’ll only have to clean and maintain them every few months. Industrial machines are going to require a bit more maintenance if you’re using them for long periods of time. Both types have readily available replacement parts. Plus, any brand that we recommend below will have exceptional customer service. Industrial sewing machines can cost as much as $2-5 grand EACH. Don’t worry, because there are plenty of options available for budget craft studios. Many beginners INCORRECTLY conclude that industrial sewing machines are somehow better than domestic sewing machines for sewing. And from what we’ve covered so far, it’s not hard to see why. But the truth is…NEITHER machine is better overall…and NO machine on the planet is perfect for EVERYTHING. That is why, more than just these two umbrella categories…. Sewists use a WIDE range of sewing machines, each one tailored for specific tasks. First things first, although all sewing machines are made different, they share remarkably similar fundamental features. And while you can learn a lot about cleaning and caring for your machine by just referring to the user manual, the same certainly cannot be said about “understanding” your sewing machine. Using a sewing machine isn’t something as simple as it may seem, and while you may be able to learn the basics on your own, being able to get the most out of your machine is going to take some time and effort. 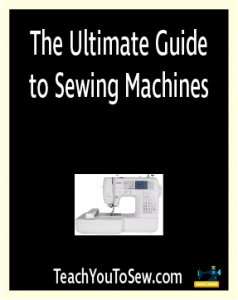 With that said, this rather technical but straightforward guide will help you get familiar with your machine and its parts, which, in turn, will help you build a strong “sewing” foundation. Bobbin is something that holds the thread for the machine, and makes up the bottom part of the machine stitch. The bobbin case, as you could guess, is what the bobbin is placed in. It’s important to note here that both bobbins and bobbin cases are specific to a particular model and brand of sewing machine, and hence can’t be shared across different machines. You would only want to use bobbins and bobbin cases that are specifically designed for your machine’s brand and model. Depending on your machine, it may either have a slide plate or a bobbin cover that allows you to manage the bobbin. This is a removable part of your sewing machine that is responsible for keeping the fabric in place. Depending on the nature of the sewing job, different types of pressure foots may be required for best results. For instance, a nonstick foot would turn out to be ideal for working on an oilcloth. The needles are another removable part of a sewing machine, and available in a wide range of sizes. The needle clamp is the part of the machine that holds the needle. Also sometimes known as the needle plate, the throat plate is an important part of your sewing machine located underneath the needle and pressure foot. It has a small opening that allows both the thread and needle to do their job. A vast majority of throat plates come with small notches that go a long way in doing sewing tasks such as sewing straight lines with a great accuracy. A throat plate can also be removed for cleaning the parts of your machine below it. Feed dogs are small teeth-like metal parts that help you sew a better stitch. They move and pull the bottom fabric gently as you sew and make it pass through the machine in a uniform manner to avoid uneven sews. It’s highly recommended to use them instead of trying to pull the fabric manually, which can result in uneven sewing as well as damage some parts of your machine such as the needle. As the name suggests, this tiny dial ensures that the top thread is working with the right amount of tension. This is crucial to have the right balance between the top thread and bobbin, which is again an important requirement for uniform stitching. A higher-than-needed tension on the top thread is likely to result in broken stitches, while a tension that’s too low is going to leave you with very loose stitches. Depending on your machine, the take-up lever may be located at different areas of the machine. The take-up lever allows the top thread to pass through it, moving in total sync with the needle in the process. Before starting to work on any sewing task, make sure the take-up lever is pulled up to its highest position (which means the needle too should be at its highest position); this will prevent the fabric from getting caught in the handle. If your machine has an external bobbin winder, it will allow the thread to pass from the spool to the winder. The bobbin winder holds the spool when you’re filling the bobbin. To ensure an evenly winding thread, make sure the bobbin is empty before you start working. There’s the upper thread guide and the lower thread guide, and the thread passes through them in a way that helps it move with just the right amount of tension. This part looks like a slightly thicker, different needle, and holds the thread while the machine is working. Some machines also have more than one spool pins though, for unique sewing tasks or to achieve different results. It’s sometimes referred to as twin-needle or decorative sewing. While spool pins usually seem to be vertical, it’s not exactly unusual for them to be horizontal in shape as well. A flywheel or handwheel, as it’s sometimes called, takes care of lowering and raising the take-up lever. It should always be turned towards you. The name of this part does a good job of explaining its purpose, so we will spare ourselves the trouble of doing that. Something to note here, however, is that while the older machines have a dial that you can use to select from different stitches, the newer ones have buttons. All manual machines and some electronic machines will have a dial to let you decide the stitching length. The way the length is going to be measured, though, is going to vary quite a bit from one machine to another. On some machines, the length will be measured by inches, while on some others, by metric scale; there will also be some machines where you will only have a numerical scale from 0 to 9. Coming to the ideal stitching length, it’s going to vary too, depending on the type of sewing project as well as the fabric being sewed. For the usual sewing projects, medium lengths may work well. While working on fine fabrics, however, you would want to keep the stitch lengths short. When it comes to heavier fabrics, as well as sewing jobs such as gathering or basting, the stitches will need to be long. Some electronic and advanced sewing machines will come with a menu option that will allow you to manage many functions and even the stitches. They would also replace other features and parts such as dials for setting the stitching length and width, as well as for separate stitching. The reverse button is also known as a backstitch button because of what it does. Basically, it allows you to switch the direction of the stitch, from the beginning to end and vice versa. The foot controller can partially control the speed of the stitching. When feeding fabric into the throat plate, make sure there’s a safe distance between your fingers and the pressure foot. When pausing while working on the fabric, don’t keep your foot on the foot controller in order to avoid accidentally starting the stitching. If the pause is going to be very long, you might simply want to disconnect the machine from the power plug just to be on the safe side. For the final section of this post, let’s take a moment to discuss BRANDS. The deeper you get into the world of sewing, the more apparent it becomes that virtually ALL of the top sewing machines come from a small group of 5-6 big brands. Click any of the above links, and what you’ll find is a list of the top sewing machines from each company. Go through each of these articles and by the end, you will know 95% of the top machines in the sewing industry. Click here to go back to our reviews!